I have just discovered my back is not as limber as it was when I was in my 20's and 30's. Once you hit 40 they say it's all downhill...or maybe uphill, when you think of the work it takes to keep your body and back healthy. Like Joe Pilates always said "The age of your body is in direct proportion to the age or health of your spine." Boy, he definitely had that one right! The Pilates back exercises in my road map are not the end all of your healthy back routine, but if they can be the beginning. Your daily back exercise routine can be accomplished in 5- 10 minutes or you can add more Pilates exercises and take 20-30 minutes if you want more visible results. 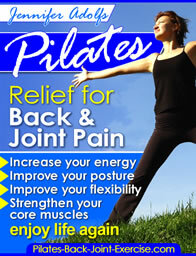 Stretching exercises for the back help to release the muscles that pull on the back that can cause pain. 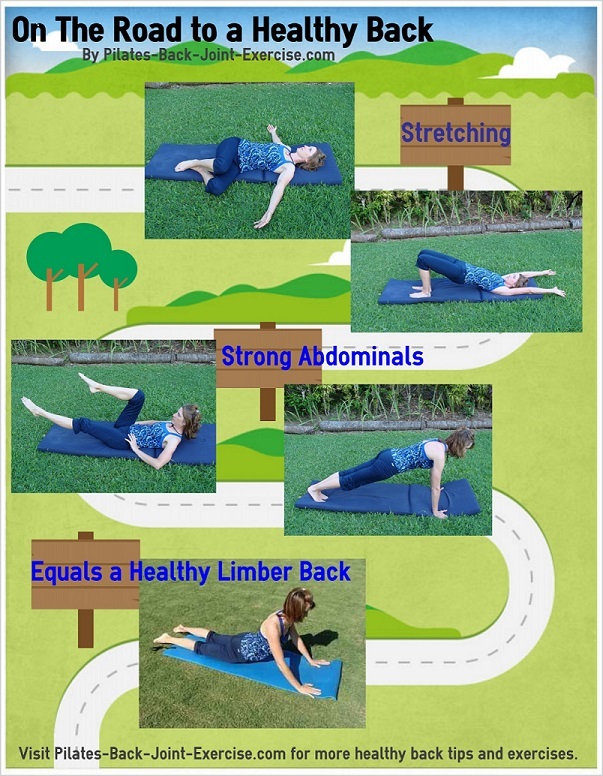 I have shown you a couple of my favorites as a sampling of good back stretching exercises above. Paired with a good stretching routine is having strong abdominal muscles. Not just the superficial rectus abdominus, but I'm talking about your deep transverse abdominal muscles. This muscle group lies deeper than the rectus and supports and protects the spine while achieving the flat tummy look on the outside. The Pilates abdominal exercises shown are a couple that will help you achieve both a flat stomach and a healthy supported spine. The plank and the bicycle are both challenging for the core muscles in that they force you to contract and strengthen the deeper transverse abdominal muscles. A happy, healthy, and very limber spine that will allow you to do the cobra stretch shown above with ease.